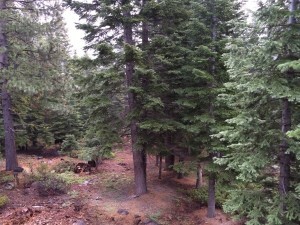 The Long Weekend may be over, but the sight and sound of being on the Western States Trail vividly remained in my head. Now I am even more stoked about pacing at the Western States 100 — the Holy Grail to ultra runners. I first heard about WS100 from Mike, my trail running mentor, a super cool ultra-runner that I look up to. Then I got the chance to volunteer at The Last Chance aid-station with the Striders last year when Mike was running this race for the first time. 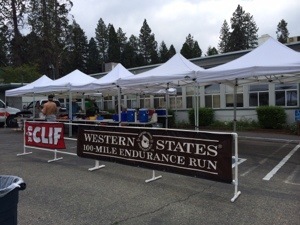 Working at WS100 aid-station offered the awesome chance to support trail running community, and be so close to elite runners that I could only read about on social media — I was completely starstruck!!! Where else would I see Rob Krar, Dylan Bowman, Max King.. in person, and Hara-san in US? The chance of me running at WS100 is just non-existent, and I have been telling everyone that working at aid-station is the closest I would ever get to the Western State Trails. But that “non-existent” chance came up very unexpectedly earlier this year, and how lucky I am! Mike offered me a pacing opportunity; he asked if I would like to pace him at WS100 this year!! “Would?” “Like?”? You kidding me?! Secretly, without telling anyone including Mike, that offer brought tears to my eyes because I was so deeply moved. It’s the best kind of offer to a runner and best kind of gesture to a friend. I am very clear that I am not a runner with enough experience or speed to pace Mike, and he could have any trail runners ( I mean anyone, really) fighting over to crew and support him at his race. I had just started a new treatment cycle at Stanford, and it’s so generous of him to give me a chance to be at a race that I can only dream of. It’s really not about me pacing him, instead it’s him helping me climbing up a tough uphill all the way, and pulled me out of the dark valley to the summit and finish my personal ultra. My race! Couple months ago when some of my running friends were talking about the WS training runs over the Memorial long weekend, I didn’t give it much thought since I am far from running a 50K anyway, especially not on the WS100 course. But a week before the long weekend Mike asked about when and how Luc, Kim and I would go up to Tahoe for this training camp. I told him I would love to but honestly didn’t think I can do 20ml or 30ml hence I didn’t sign up. He said not to worry, just come up, and he would figure something out. It probably felt like a Ginger Runner interview to him when I excitingly shoot my questions, “So.. how do you feel after Quick Silver 100? And by the way, congrats on the 12hr 59min finish.” We chit chatted about his game face at QS100, running in Bay Area, his love of outdoor life in Colorado, backpacking through Japan..etc. And I was laughing so hard about his holding 1st place for some miles at a 50K trail race because the lead runners took a wrong turn and got lost. And then he got an email from the race people congratulating his “setting a female course record.” That’s just so hilarious!! Because every cells of Kim screams testosterone!! Luckily there wasn’t much traffics even though it’s the eve of a long weekend, and we reached Foresthill easily. My heart twitched when spotted the sign of “Foresthill” and that gas station; there was a trip from previous life. Sigh… Anyway, it started to rain and we were driving through heavy fog in beautiful mountains; we decided not to stop for any food and just kept going. Kim is a perfect road-trip partner, and in the pitch darkness he could find Mike’s place in forest without address or direction, brilliant!! After a brief discussion about their runs tomorrow with trail names that I couldn’t quite catch yet, Mike told me to meet Kim around 2:00pm at Foresthill Elementary, and then it’s time to catch some zzzZZz…Next morning around 7:30am, I opened my eyes in a warm bed and found the house filled with aroma of coffee and soft music. Rain continued to coming down persistently. 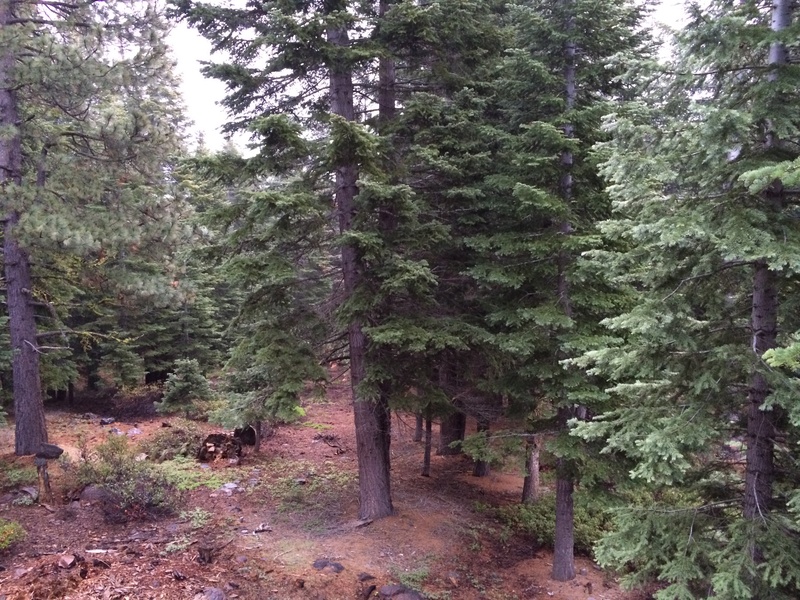 I helped myself with some granola and almond milk, and looked out to the rainy and chilly forest, how beautiful. Around 10:00am, I put on my running cloth and decided to check out the Wild Cherry Coffee near Donna Pass. It’s obviously so non-Silicon Valley, so not hippie, so not pretentious! Grabbed a large hot coffee and I was on my way to Auburn. The drive was a bit tense as the heavy rain has turned the forest & roads so misty that I couldn’t see well in some sections. Took me about an hour and 40 mins, and I found the familiar race start setup — the tents, dusty cars with stickers, aid-station food and volunteers in puffy jackets.. etc. I chatted with local folks and asked if anyone might be heading to CAL 2. Soon I saw fast runners coming back after their 50k run, all looking relaxed and fresh like they haven’t been running, and I tried not to bug them with silly questions or ask them for pictures…etc. When I saw Ian Sharman biting watermelon I thought “wow, The Spiderman is having watermelon right in front of my eyes! !” An hour or so later, Vinh and Kiyoko came in and they looked a bit beat!! I hangout with them for a while till Kim came back through that finisher tent, but he turned back right away and later I learned that he went back for Mike and Christine — a friend of Mike. When the three of them came in it was close to 4:00pm already. It started to look overcast, and we could hear the thunder in distance. 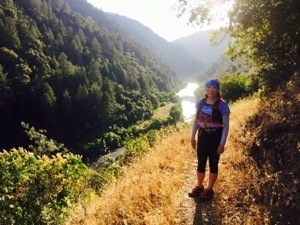 I refilled Christine’s hydration pack and they continued on with their run — 50ml for the day. Kim went on to be fed and put on warm cloth first, while I told Vinh and Kiyoko to wait in Kim’s car when I go running. 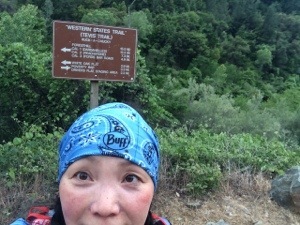 It took us some effort to find where to intercept the trails and meet up with Mike and Christine at CAL#2 (Peachstone). It was raining hard, and thunder was loud and close-by; it was cold, dangerous and scary, but at the same time so exciting!! 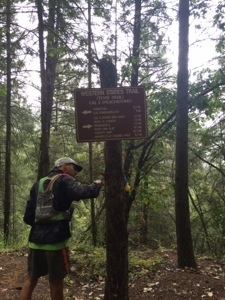 As I standing by the sign of “Western State Trails”, my heart was singing even louder than the thunder above us. My windbreaker was completely soaking wet and mosquitoes were biting through my sleeves and Kim’s hat.. they were having a fancy meal! Several runners came by and we asked if any of them had seen Mike & Christine. Couple runners gave up at CAL#2, and I totally could see it being the most logical and sensible decision at this point. Then we heard Mike’s voice echoing in the canyon! Mike came in first and talked about he might stop running here so wouldn’t get hypothermia, and I secretly prayed that they would continue this crazy run because “I am here, at Western State!! How can I not want to run here?” Good thing that I am never short of crazy running partners, Mike decided that we would continue our run to Rocky Chucky and Kim would pick us up after retrieving our car. As soon as we started running, the cold, rain, thunder, bugs.. none of them concerned me at all, and Mike looked very energetic! He told me “oh, here is the section that Rob Krar past Max King and totally demoralized him.” “After we pass this big hill and two ridges, you will see an open, just wait and see, will be totally worth it.” And just like what he had told me, the rain stopped and sky magically opened and I was staring into this amazing view of river with sun flickering on it. What a reward!! For view this beautiful, you got to run extra hard to earn it, just like life, you have ups and downs and then you earn your rewards after you overcome the challenges! We ran through the Soaking Stream. the Sandy Bottom, and Mike was talking about how this year the WS100 would be a heated race, not the weather but the runners!! Rob always owns this course and he is going to defend his title for sure, and Max King will be running this for the 2nd time and definitely he will apply lessons he had learned from last year which was his first 100miler, and Seth Swanson will come back to fight for the title, Ian is looking strong, and Jorge is winning races..etc. All the great runners are going too be in this year and makes this extra competitive and exciting! The run was going well and fast without noticing it and I was learning so much about history & stories of WS100. Soon we arrived an open area by the river, and I spotted the Rock-A-Chucky sign and Kim was waiting. That night we had pizza, Auburn IPA and champagne for today’s epic run, followed by foam roll and watched a Sally McRae movie “Western Time“… an awesome weekend for ultra runners!! 5 weeks to WS100 and I just can’t wait!! !